A few months ago, when I was first introduced to Pinterest, I came across this idea from Real Simple. I thought it looked like something the kids would enjoy, but we just never got around to doing it over the summer. Then this week the kids had a day off school and it was the first day it didn't rain in what seems like ages! I gathered up some balloons, plastic cups, mini marshmallows and pom poms and we had a great time. 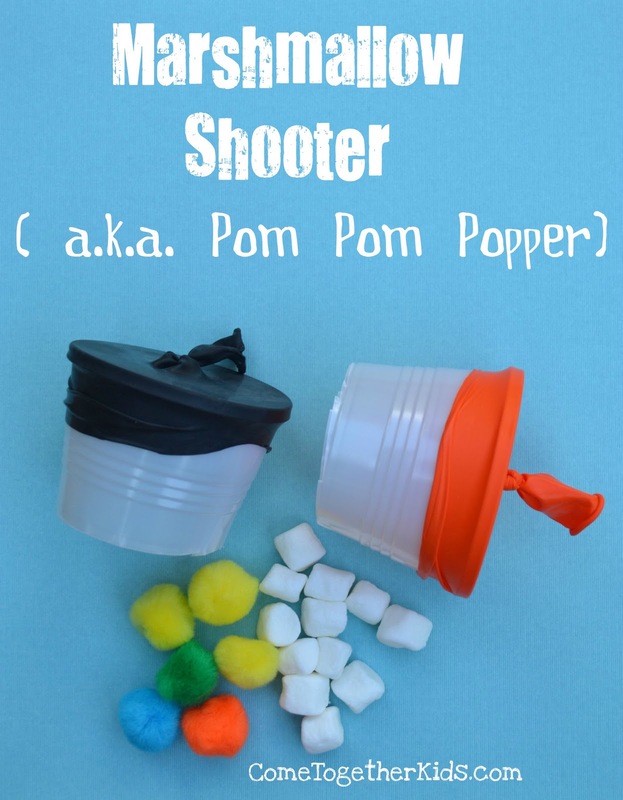 These little contraptions are really easy and inexpensive to make, but boy, can they really launch a marshmallow! 1. Cut the bottom part off of your plastic cup. I found it worked best to double up the cups and I cut off the bottom third. See how there's two cups nestled together? 2. Tie a knot at the end of your balloon and cut off about 1/2" from the other end. That's it! Now it's time to do some launching! Just put your marshmallow inside the cup on the knotted center, then aim the cup away from you, pull back on the outer knot and launch away! We drew a launching line with sidewalk chalk. Several marshmallows in at a time don't go as far, but it was fun to watch them burst out. We also shot a pom pom straight up in the air, then tried to catch it in the cup. It's a little tough to see, but we drew targets in chalk on the cement. He's marking the spot where my marshmallow landed ~ Look how far it went!!! These were so inexpensive and easy to make and sooo much fun, that we'll definitely be launching some more marshmallows (outside, of course!) and pom poms (inside, but not at each other!) soon! This will be an amazing present for my ten year old brothers birthday. What boy wouldn't love launching marshmallows through the air? Thanks for your help! THANK YOU for sharing this idea! Simple. FUN! I plan to use it as an opener activity 1st day of our Mom-2-Mom Coop Class for Kids! All ages together. They'll love the activity and we'll take to the church parking lot to wow the moms with our shooting ability. BET some moms want to try shooting! This goes without saying that you'd have to teach the kids using it "NOT shoot it into their mouths", because you just know that some kids will try that, and it could cause something to lodge in their throat. Just an 'ounce of prevention' thought, since kids put everything into their mouths, especially if they are younger. These are awesome! I didn't have the cups so I scrounged in my pantry and came up with the little metal fruit cups with the pull tabs. The pull tab edge is not sharp and the other end I opened with a can opener that cuts on the side the kind that doesn't leave a sharp whee either.) Rinsed it out and placed the balloon on perfectly. It had a good edge to hold it. We all had so much fun. Used cereal to shoot out of our little canons. these look so fun! you always have the coolest stuff! Are you sure you're not a homeschooler? Thank you for another great craft activity! Ok, let me start again with this comment. LOL! I looove these! My 7-year-old will get a kick out of making a few of these. I can totally see him shooting marshmallows at Daddy. Haha! Awesome idea! Sorry about the first comment, I mentioned coming to check out my pumpkin play dough and then it dawned on me that you already had. Wow. I need more coffee. Have a great day! Great tips on making these. I saw the original idea as well, but like to hear real world experiences. Glad to know they were such a hit! Oh my goodness, my boys will LOVE these. Thanks! Oh my goodness. My kids are going to love this! Pinning it now! I'm wondering if I can toast some stale bread squares and use these to launch bread to the ducks at the park. They get a little too close for this mom's comfort. hi becky! this is a great idea for feeding the ducks at the park. however, most people dont know that bread is actually bad for ducks, and most wildlife. instead, please consider feeding them cheerios, grapes cut in half, a thawed bag of frozen peas or corn, or kale, romaine or other leafy greens (not iceberg lettuce). these foods are nutritious for them and wont make them sick like bread and crackers will. Please don't feed the ducks. You're trying to repel them, but you're FEEDING them, which attracts them! Ducks can find their own food. Feeding them makes the reliant on humans, and (as you've noted) attracts them to us - which is a nuisance and potential safety/health issue. Many cities have by-laws in place regarding feeding animals. Just don't do it, and encourage others to stop also. Oh my goodness, that's an awesome idea! The ducks always freak me out too! Fantastic! My boys have a couple different versions of marshmallow launchers, but this is the least complicated one I've seen. How fun!! My son is going to love this! Welcome over to my site to share this at my link party on Monday! your version is way cuter! Oh dear, we may have to try these at our house! My kids have tried the bigger ones made out of pvc pipe, but these look like a lot of fun and safer! Marshmallows are not food. Putting something in your mouth does not make it food. Very cute idea, and how fun! Lol...looks like they had a great time with it. So cute! Thanks for the idea! We did it! It was so much fun! Hi! I just posted our marshmallow shooters! Take a look! My boys would love this. Thank you so much for linking up! Sharing it over on Facebook too. We did this today. It was awesome. Then we took it a bit further and added side walk chalk paintballs. Heaps of fun. So fun i had to blog about it tonight. I put a link onto your page to give you cred's. Thanks again. How simple & FUN! This looks so cool for kids & us adults!!! This is such an awesome idea! So glad I saw your post featured over at Milk & Cuddles! I think I have everything I need on hand -- so perfect since my girls are on Fall Break this week! Love this idea! I'm going to use it for Sunday School! This would be a perfect birthday party activity as well! We made catapults once at my son's 'knight' party, but these would have been so much easier! I forgot to mention, I'm your newest follower. totally LOVE it! I had pinned this before I even saw the tutorial! it just looks like too much fun! That would be cool to do with bird seeds or croutons for the birds out in the park! That looks like so much fun- my boys would have a blast!! Thanks. gotta try this one!! We had to post our pavillon as a "No Marshmallow Zone" at the Family Reunion. I just did this but I used an empty yogurt cup- works great! my kid made this with a toilet paper tube,and shot pennies at his sister... they leave BIG marks! This is truly brilliant! It's going in my "Fun with Grandkiddies" file! We had so much fun with these today! I just drove my dog crazy trying to chase my launched mini marshmallows! I had to modify a bit as I didn't have any cups, so I cut off the top third of a water bottle. Works great! My summer campers will think this is a big hit! Did this with my son's Cub Scout den ... they absolutely loved it! We tried this today, but the cups kept ripping. Finally cut off a soda bottle, and used the neck opening to stretch the balloon over. Kept it in place by a tight rubber band. Grandkids loved it. Doing this as an activity for my sons birthday party. My dd & I just tested them & they shot over our fence!!! I can't wait to give this activity a try! My boys will LOVE it. Thanks for sharing!! Hi there! Found this posted in Pinterest and I happen to be planning my son's b-day party at the park for this weekend. I am SO going to try this. Thanks for sharing this cute idea! This is brilliant. Your son catching the balls reminds me of a toy I had that pinged a ball out and you had to catch it. You could also use rolled up bits of cooking foil, I think they would go far. You could also set up targets to improve their aim. OMG these might be the most fun we have had all summer! We also used Dixie cups and that works really well. Shot them straight up and they go farther. LOVE THIS! Just spotted this on Pinterest. Clever idea! I'm going to try balling up hunks of bread and have the boys feed the birds/ducks while we're at it! Marshmallows sound fun - but not the ants that are sure to follow. Thanks again for the cool post! I've been trying to make these this morning and am frustrated! I'm only cutting a tiny bit off the balloon but having a hard time getting it to stretch over the cup and then an even harder time getting it to stay. I'm tempted to blow up the balloons first just to stretch out the rubber a bit before I put them on--maybe they'll stay put better. Oh no, Heidi. The only thing I can think of is that your cups are a little bigger than ours or your balloons are a little smaller. Ours were 9oz cups and 12 inch balloons. How big are yours? Tried it with the cups and had a hard time getting the balloon to stay on, plus the cup kept collapsing in. I ended up using an empty water bottle instead. I cut off the bottom of the bottle and put the balloon on the "spout" end of the bottle. It works great! I used 2 9 oz cups and cut them at the same time with a "hot knife." I then ran a strip of black duct tape around the cups which not only held the balloon on but I turned a little bit down over the rough edge of the cup and it made it stronger and sturdier! It made it so it would last SO MUCH longer and the rough part of the cup wouldn't tear. I used it for a church lesson where it was talking about "firey darts of the adversary!" They had to NOT get hit and there were safe places where they could stand. Oh,if you are worrying about cleaning them up, the birds...especially sea birds and pidgeons take care of that! Great project! Thanks so MUCH! Awesome idea! I think I might bring some stuff to make these this weekend on our camping trip! I saw the pic on Pinterest and followed it back here. What a great idea. I made one with my daughter and now she is shooting treats in the yard for the dogs. Looks like such a fun idea! Can't wait to make this for my little guy...and me too :). I might do my own post and link it back here, it that alright with you? Absolutely, Michelle! Have fun with it! I wonder about a toilet paper tube!? hilarious! can't wait to try this with my son! thanks! Wonder if Cheese Balls would work? Gonna try this with my cousins. OMG Love these!! I just found them on pinterest!!! I put numbers on the part you cut off to use as targets!! After our cups mangled, we used a shallow can and our cool can opener instead of the plastic cup. The can opener somehow cuts the top of, leaving no sharp edges! Used a hacksaw to cut a mailing tube into 2 inch sections and clear package tape to secure the 12" balloons. Durable! So cool. I can't wait to try this at our next play date! Thanks for this! We'll be making these as a craft/game for my boys' Angry Birds birthday party (we'll buy pom-poms in primary colors and pretend they're tiny birds). I'm sure the kids will have a blast! Personally, i LOVE the fact that they can do it in the house and the projectiles won't hurt anyone/damage anything! Doing this for our grandson's 8th birthday party! Thanks! Deffinitely using this idea with the two boys I nanny! Love this! We made a couple this morning and will be doing them for a boy's craft class on Monday. I so appreciate your note about using 12" balloons. The 9" ones don't quite do it and that's what I had mostly in my stash. This came in so handy for the Ghostbuster's Birthday Party we just threw for our son. Thank you so much, I've linked your tutorial to my blog post. What a fun Mom you are! Thanks for this fun idea. I'm going to bring this to my After School kids for a fun outside project. I wonder if they could use a Sharpie to write their initials on the marshmallow for a distance contest. We used leftover paper rolls instead of cups. Worked great! Also, popcorn doesn't work so well as they exploded :). I also think this would work great for adult entertainment and shots ;). We all still have fun with that too, from time to time? These are so fun and inexpensive to make! I made these with a group of 1st graders, and they LOVED them! We tried making them with the plastic cups, but they kept caving in. Even when using 3 together. Instead, we used 2 styrofoam cups together, and they were perfect! The kids decorated with colorful duct tape (to hold the cups together and to keep the balloon secure. It was REALLY easy and they played for the longest time! Hi, my daughter loved these so much that she used them as her 4-H Working Exhibit, there have been many people who have enjoyed having the opportunity to make them through her 4-H project. Thanks for posting! My grandson would love this!! Thanks so much, Michelle! I am so glad it was such a hit. id just like to let the people who mentioned feeding bread and crackers to ducks know that these foods are actually very bad for the ducks, and most wildlife. feeding the ducks can be a lot of fun, but i urge you to consider feeding foods such as cheerios, grapes cut in half, a thawed bag of frozen peas or corn, or kale, romaine or other leafy greens (not iceberg lettuce) instead, as these foods will actually benefit the ducks by providing them nutrition they need, but wont cause them to get sick or develop the health problems that bread and crackers do. if youd like more information on why bread and crackers arent good for them, or more information on the ducks in general, please check out the link: http://www.duckrescuenetwork.org/duck_care.html#park or if you arent comfortable clicking a link from a stranger on the internet, go to duckrescuenetwork.org. thank you!! شركة امتار علي اعلي مستوي من الجودة في العمل عزل خزانات بالرياضعلي اعلي مستوي من الجودة في العمل استمتع الان باقوي العروض من خلال شركتنا . شركة من اكبر الشركات في مصر في اعمال شركة تسويق الكتروني علي اعلي مستوي اقل الاسعار من خلال شركة سوقني تصميم مواقع الالكتروني علي اعلي جودة . شركة من اكبر الشركات بالمملكة العربية السعودية شركة تركيب مصاعد استمتع الان باقل الاسعار في المملكة العربية السعودية شركة تركيب مصاعد علي يد متخصصين ذو كفاءه عالية ى. رحلات متميزه جدا في افخم الفنادق والشاليهات في العين السخنة رحلات العين السخنة علي اعلي مستوي استمتع باسبوع ترفيهي علي اعلي مستوي من التميز افضل الخدمات داخل الفمادق . من مميزات توكيل صيانة ويرلبول في مصر حملات الصيانة المجانية علي اعلي مستيو من التميز استنمتع الان بالكثير من الطرق الحيدثة في اعمال الشركة . شركة فرسان الخليج علي اعلي مستوي شركة نقل عفش بالمدينة المنورة الان في نقل اثاث علي عربات مجهزه علي اعلي جودة في العمل استمتع الان بالكثير من تالخدمات والتنظيف وغيره من خلال موقعنا .